As I am sure you know, because I posted so many pictures here, I did a lot of crocheting last fall/early winter for Christmas presents. That hexagon blanket big enough to cover the top of my parents' king size bed, a couple of headbands, and more hats than I can remember (at least 10). 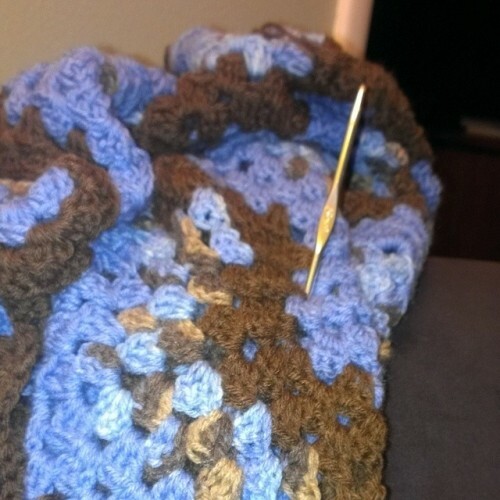 By the time I started a baby blanket, I was so over crocheting, I had to put it away. About 1/3 to 1/2 way through a baby blanket I promised someone, I just couldn't do anymore. I told my co-worker, Christen, that Scout would have it by his first birthday. Getting the itch again, and after buying more yarn that I didn't need yet bought anyway because it was on sale last weekend at Hobby Lobby, I pulled my project back out this week. I'm hoping to whip it out. It may end up more of a vertical stripe blanket because I think I'm going to run out of yarn to make it be horizontal stripe. This year, I'm hoping to make up a bunch of hats before winter and have ready to sell before Christmas. However, you know me and my good intentions.